Mccardle, Bennett. "Kahn-Tineta Horn". The Canadian Encyclopedia, 08 May 2018, Historica Canada. https://www.thecanadianencyclopedia.ca/en/article/kahn-tineta-horn. Accessed 19 April 2019. Kahn-Tineta (Kahentinetha) Horn, political activist, civil servant (born 14 April 1940 in New York City, NY). Kahn-Tineta (Kahentinetha) Horn, political activist, civil servant (born 14 April 1940 in New York City, NY). Kahn-Tineta, meaning "she makes the grass wave" in the Kanienkehaka (Mohawk) language, is a member of the Mohawk Bear Clan of Kahnawake, Québec. Horn started her career as a model, actress and Mary Kay cosmetics saleswoman. She was crowned Indian Princess of Canada in August 1963. As a public speaker, Horn attracted national attention to Aboriginal causes, such as control of land and resources, and treaty rights. In the early 1960s, Horn became a director of the National Indian Council (NIC), an organization created in 1961 to represent the political, economic and social issues of Status Indians, Non-Status Indians and Métis. While the NIC claimed to unify the voices of Aboriginal peoples, some accused it of being exclusionary: the NIC did not represent the Inuit; and it had difficulty representing the differing views of Aboriginal communities. In November 1964, a council member sent a confidential note to the executive director of the NIC, Wilfred Pelletier, which revealed Horn’s own critiques of the organization. The memorandum claimed that Horn disapproved of Pelletier’s appointment; she believed that the executive director should have been elected. The memorandum also accused Horn and Chief Richard Pine of trying to create another organization that would better represent the views of Indigenous peoples. In 1964, the NIC fired Horn from her post as a director and revoked her pageant title of Indian Princess, a contest that the NIC sponsored. The NIC justified her dismissal on the grounds that she wrongly presented her own views publically as those of the council. In the following year, the dispute received mainstream media attention. Horn openly criticized the NIC in Regina’s Leader-Post, claiming that the organization was increasingly “being controlled by non-Indians.” While she distanced herself from the NIC, Horn continued to fight for Aboriginal causes. During the public hearings on the Royal Commission on Bilingualism and Biculturalism in 1965, Horn, rather than the NIC’s Pelletier, submitted a brief, expressing concern for Aboriginal rights in a sovereign Québec. Her speech attracted much attention and highlighted the importance of Aboriginal heritage and languages. By 1968, the NIC dissolved and splinter groups formed: Status and Treaty Aboriginal peoples formed the National Indian Brotherhood (now known as the Assembly of First Nations) in 1969; Non-Status and Métis peoples formed the Native Council of Canada in 1970; and the Inuit formed the Inuit Tapirisat of Canada (now the Inuit Tapiriit Kanatami) in 1971. Throughout the 1960s and 1970s, Horn was active in Aboriginal civil rights movements, such as the Red Power Movement and the American Indian Movement. As a means of defending treaty rights and protecting traditional ways of life, Horn founded and directed the Indian Legal Defence Committee from 1967 to 1971. She also took part in numerous protests. Horn sometimes used sensational tactics to attract attention to important issues; during one protest, she dumped rats in a government meeting to illustrate illegal dumping on her reserve. In another well-known incident on 18 December 1968, Horn led a group of about 60 Kanienkehakaprotestors in a blockade of the Seaway International Bridge in Cornwall, Ontario. The group protested cross-border duties, arguing that the federal government was in violation of the Jay’s Treaty of 1794–95. The charges against 35 protestors were dropped in March 1969. In the end, the taxes were not removed, but the event demonstrated the cross-border nature of Aboriginal issues and causes. 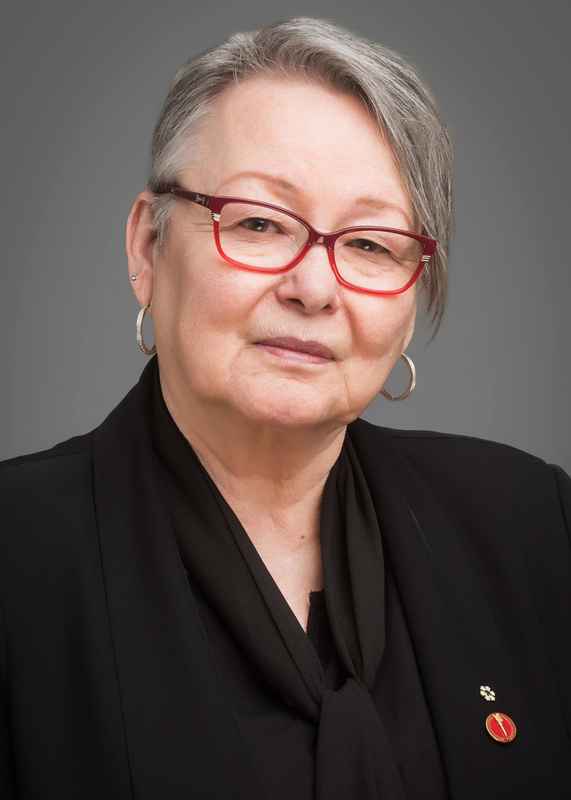 While Horn participated in protests and was arrested on more than one occasion during demonstrations, she still advocated that Aboriginal peoples use “law and order” to achieve their ends. In 1973, she began working as a civil servant at the Department of Indian and Northern Affairs Canada (now Indigenous and Northern Affairs Canada). There, she held various positions in the social, community and educational development policy sections. Horn received international attention for her controversial views about Aboriginal status and identity. She openly supported “Indian apartheid” or separate development, which included preservation of the reserve system. Consequently, she vehemently opposed the 1969 White Paper, which sought to dismantle the reserve system. Horn was also opposed to Aboriginal-white intermarriage, which she saw as threatening to the fate of Aboriginal peoples. In an interview with the Montreal Gazette in 1971, Horn explained that while she “[did not] hate white Canadians or Americans,” she believed that “an Indian who marries a white is no longer an Indian and cannot be again.” For Horn, Aboriginal identity was defined by blood quantum (the amount of Aboriginal “blood” possessed by an individual, as determined by their ancestry). The Kahnawake Mohawk Council, which governs Horn’s reserve, also opposes intermarriage. Since 1981, those who married outside the culture were supposed to leave the territory. Currently, the council’s policy on intermarriage is being contested by Horn’s daughter, the Olympian Waneek Horn-Miller, who in 2014 entered a lawsuit against the council for evicting her and her non-Aboriginal partner, Keith Morgan, as well as other interracial couples in 2010. The case is currently before the courts. During the 1960s and 1970s, Horn commented on issues related to the women’s movement. She advocated the importance of women’s place in the home, as a means of passing on traditions to children. However, she also supported women’s independence; in 1971, Horn told the Montreal Gazette that her own story serves as an example of how a woman can raise a family and make a difference in the world all on her own. She also expressed frustration at patriarchal laws and traditions that would force a woman who married a man from another reserve to leave her reserve for his. For these reasons, Horn explained that she chose to remain single and raise her daughters — Ojistah Horn, Waneek Horn-Miller, Kaniehtiio Horn and Kahente Horn-Miller — on her own. Horn appeared in films about Aboriginal history and territory, including the 1964 short film, David Thompson: The Great Mapmaker, which recreates the story of David Thompson — a man who mapped 1.5 million square miles of uncharted territory, and Artisans de notre histoire, Volume 2: Les Explorateurs (1995), a short film that explores European exploration and colonialism in Canada. 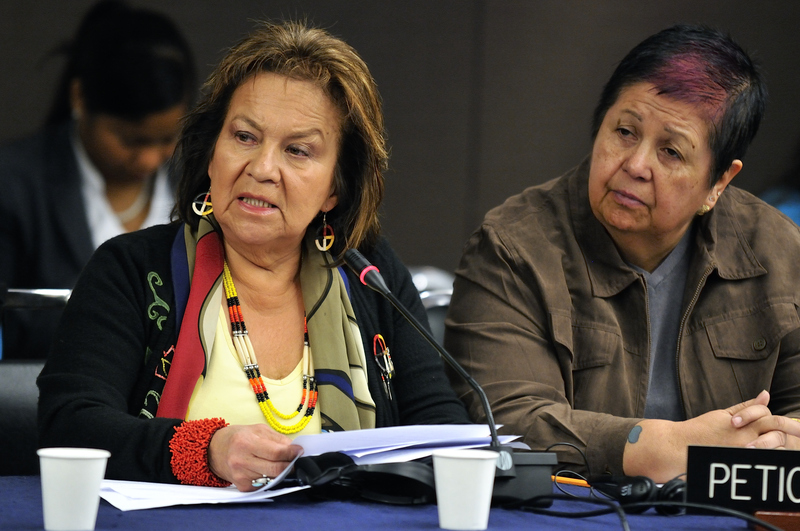 Horn and her daughters, Waneek Horn-Miller and Kaniehtiio Horn, were notable participants in the land dispute between the Kanienkehakapeople and the town of Oka, Québec, in 1990. At the height of the Oka Crisis,14-year-old Waneek was stabbed in the chest by a soldier’s bayonet. She had been trying to protect her four-year-old sister, Kaniehtiio, from the chaos of the 78-day standoff. A photograph of the incident was published on the front page of newspapers and symbolized the intensity of the Oka Crisis. Horn has assisted Aboriginal communities with title and land claims disputes. In 1995, she coordinated the Free Wolverine Campaign, which sought to liberate Jones William Ignace, a 64-year-old Shuswap elder. Ignace was imprisoned on 29 September 1995 for defending unceded land near Gustafsen Lake in Shuswap Territory. He was released on 4 February 1999. Other efforts included giving a speech about Aboriginal lands at McGill University in 2002, “How Canada Violated the BNA Act to Steal Native Land: The Forgotten Arguments of Deskaheh.” On behalf of the Haudenosaunee in 2006, Horn and another activist, Katenies, submitted a notice of seizure to the developers of the Melancthon Wind Farm near Shelburne, Ontario. Horn has also served as director of the Canadian Alliance in Solidarity with Native Peoples, which performs advocacy work with Indigenous peoples and provides education about Indigenous culture. In a dispute that turned violent, Horn once again defended Kanienkehaka territory along the Cornwall–New York border, known as the Mohawk Nation at Akwesasne. On 14 June 2008, Horn and Katenies were stopped by Canadian Border Services Agency (CBSA) guards on their return to Canada from the United States. When Katenies refused to acknowledge the authority of the CBSA agents, who intended to apprehend her on an outstanding warrant, she was brutally arrested. Horn was also aggressively overtaken by CBSA guards when she refused to leave the area. Horn suffered a heart attack during the incident. Horn has dedicated her life to defending and promoting Kanienkehakahistory and heritage. She has also been a spokesperson for both Indigenous issues and Aboriginal women. While some of her protests and complex opinions on “Indian apartheid” and intermarriage have been controversial, Horn has demonstrated the importance of Aboriginal causes. As publisher of the Mohawk Nation News, Horn continues to highlight events, issues and causes that are relevant to her community.